Size: 88" X 38" X 72"
- Automatic sealing and shrinking packing machine is suitable for packing pop-top cans, glass, bottles and mineral water bottle and any other bottles. 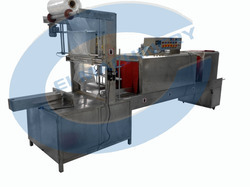 - This machine is supply counting, full-column automatic shrink without tray. - Applicable to PVC and PE shrink film. - Power Consumption: 5 h.p. We are engaged in offering the best quality of Semi Automatic Shrink Wrapping Machine. We offered Semi Automatic Shrink Wrapping Machine are widely used for wrapping different types of material in Pharmaceutical, Beverages & Other industries. These machine are fully customized and heavy duty to meets customer various requirement and packaging applications.